Biomass gasification shows a great potential to displace fossil fuels. In this paper, the potential of bioenergy production from biomass feedstock has been investigated, focusing on gasification technology as an environmentally friendly alternative. The present research is principally focused on a down draft gasifier equipment kit (GEK) unit. Biomass encompasses a wide range of feedstocks such as agricultural residues, energy crops, forestry materials, food waste, municipal solid waste, grains and starch crops. An efficient gasification unit produces syngas with calorific value up to 20 MJ/kg. Syngas predominately consists of a mixture of hydrogen and carbon monoxide. This syngas can be used in a number of different processes including electricity generation, steam generation, transportation fuels, hydrogen production as well as chemical production, fertilizer manufacturing and consumer products. Results from our research highlight the potential of biomass gasification as a strong alternative for bioenergy production and a substitute for fossil fuels. According to the United States Census Bureau (Total Midyear World Population) the world population will reach 9 billion by 2050, this increase in human population will have a direct impact in the resources required to sustain this population. The energy supply will become a more significant issue as the population grows. The World Health Organization and the United Nations development programs (UNDP), currently estimate that two billion people will require modern energy services to meet the UNDP millennium development goals (Mendua et al.). Between 80 to 90% of the world's liquid fuel needs are met by non-renewable sources (IRPS). Fossil fuels have been critical in the development of our modern society; however fossil fuels use raises serious environmental issues like global warming, acid rain and air pollution. Renewable energy is energy that comes from resources which are continually replenished such as biomass, sunlight, wind, rain, tides, waves and geothermal heat. EIA estimates that about 10% of world marketed energy consumption is from renewable energy sources (hydropower, biomass, biofuels, wind, geothermal, and solar), with a projection of 14% by 2035 (USDE). In biomass terms, feedstock is the biological source material for end products such as biodiesel, ethanol, or methanol (Agricultuare and Agri-Food Canada). Biomass includes a wide range of materials, including energy crops such as switchgrass and miscanthus, agricultural sources such as corn husks, wood pellets, lumbering and timbering wastes, yard wastes, construction and demolition waste, and biosolids (treated sewage sludge). Gasification is a thermochemical process for converting carbonaceous based materials into gaseous products called syngas. Syngas is a combination of carbon monoxide (CO), hydrogen (H2) and a small amount of other hydrocarbons. Syngas is an important feedstock for the chemical and energy industries, with a number of hydrocarbons traditionally produced from petroleum oil, which can also be produced from syngas (Basu). Gas composition is dependent on feedstock composition, type of gasification reactor, gasification agents and operating condition (USDE). The above gasification designs developed mainly for the gasification of fossil fuels but they have been adopted for use in the gasification of biomass. Currently, operating biomass gasifiers can be divided into four major categories: (1) Updraft fixed bed, (2) Downdraft fixed bed, (3) Bubbling fluidized bed (BFB), and (4) Circulating fluidized bed (CFB). In this paper, more emphasis has been given to down-draft gasifying reactor. Fixed bed gasifiers are more suitable for small scale power generation and industrial heating applications (Abdul Salam et al.). Figure 1 Capacity of two different types of fixe bed gasification units. Units in oven dried ton (odt) per day input. Biomass gasification has been the focused of research in recent years to estimate efficiency and performance of the gasification process using various types of biomass (Brar et al.). Co-gasification of coal and biomass has some synergy (Sjöström et al.). The process not only produces a low carbon footprint on the environment, but also improves the H2/CO ratio in the produced gas which is required for liquid fuel synthesis (Kumabe et al.). In addition, inorganic matter present in biomass catalyzes the gasification of coal. However, co-gasification processes require custom fittings and optimized processes for the coal and region-specific wood residues (Brar et al.). Biomass is very nonhomogeneous in its natural state and possesses a heating value lower than that of coal. The non-homogeneous character of most biomass resources (e.g. cornhusks, switchgrass, straw) poses difficulties in maintaining constant feed rates to gasification units. High oxygen and moisture content results in a low heating value for the product syngas, typically less than 2.5 MJ m-3. This syngas poses problems for downstream combustors that are typically designed for a consistent medium-to-high heating value fuel (Ciferno and Marano). As received (AR): meaning that the sample was taken at the moment the feedstock was received or harvest. Dry basis (Dry): refers to the composition of the biomass excluding all water content by heating. Dry, ash free (DAF): refers to the composition of biomass excluding all water and ash content. Elemental analysis reports the composition of the biomass in mass percentage of carbon, hydrogen and oxygen (the major components) as well as sulfur and nitrogen. Using a down-draft gasifier, different feedstocks are converted into syngas. The feedstock is partial oxidized during the process and a gas medium is required to maintain the process. The medium can be air, pure oxygen, steam or a mixture of these gases. Biomass feedstocks and gasification reactants travel in the same direction and move down the gasifier and result in a syngas which is removed from the bottom of the reactor. A grate is located at the bottom of the unit holding the feedstock from falling to the bottom. The gasification process begins with the feedstock feeding and pouring liquid fuel which accelerates ignition of the feedstock materials. Once ignition occurs four different stages begins to develop within the reactor of the gasifier unit (Figure 2). High moisture content reduces the temperature achieved in the oxidation and reduction stages, thus resulting in incomplete gasification. Forest residues and wood has a fiber saturation point at 30 to 31% moisture content (dry basis), and other biomass can have high moisture content with fresh cut biomass as high at 90% moisture content (Pakdel and Roy). McKendry recommended that biomass moisture content should be less than 10–15% prior to gasification. Although drying happens automatically in a gasifier reactor, due to the high temperature generated at the oxidation stage, the moisture content of the feedstock should be reduced using pre-treatment operations like torrefaction, in order to meet gasifier specification (Brar et al.). Pyrolysis is the decomposition of the biomass feedstock by heat. This step, also known as devolatilization, is endothermic and produces 75 to 90% volatile materials in the form of gaseous and liquid hydrocarbons. The remaining non-volatile material, containing high carbon content, is referred to as char (Ciferno and Marano, Bridgwater and Evans). The oxidation zone is called the combustion zone. The combustible substance from a solid fuel is usually composed of elemental carbon, hydrogen and oxygen. During complete combustion, carbon dioxide is obtained from the carbon in the fuel and water is produced from the hydrogen and oxygen, resulting in steam. The combustion reaction is exothermic and yields a theoretical oxidation temperature of 1450 °C (Rajvanshi). The reduction zone is the final stage in the gasification process which reduces the combustion products. In the reduction zone, the products from the oxidation zone (i.e. CO2 and H2O) are reduced to carbon monoxide (CO) and hydrogen (H2) resulting in the syngas components. At the end of this stage, the produced gas is typically cooled and is removed from the reactor for further downstream processing. The produced syngas from the reactor immediately enters a cyclone filtering system to remove water, particulates or any other impurities. There are other types of filtering systems that can be used including water scrubbing followed by a venture scrubber, or charcoal filtering system where the charcoal from the filter be used as a feedstock in the gasifier. For the filtration section, the syngas product contains some contaminants and impurities which need to be treated before usage in turbines and other utilization systems. Tars are mostly polynuclear hydrocarbons (such as pyrene and anthracene) that can clog engine valves, cause deposition on turbine blades or fouling of a turbine system leading to decreased performance and increased maintenance (Ciferno and Marano). Conventional scrubbing systems are generally the technology of choice for tar removal from the product syngas. Removal of the tars by catalytically cracking of the larger hydrocarbons reduces or eliminates this waste stream, eliminates the cooling inefficiency of scrubbing, and enhances the product gas quality and quantity. A cyclone can provide primary particulate control, but is not adequate to meet gas turbine specifications (Ciferno and Marano). Water scrubbing can remove up to 50% of the tar in the product gas, and is followed by a venturi scrubber, with the potential to remove the remaining tars to 97% (Paisley and Anson). 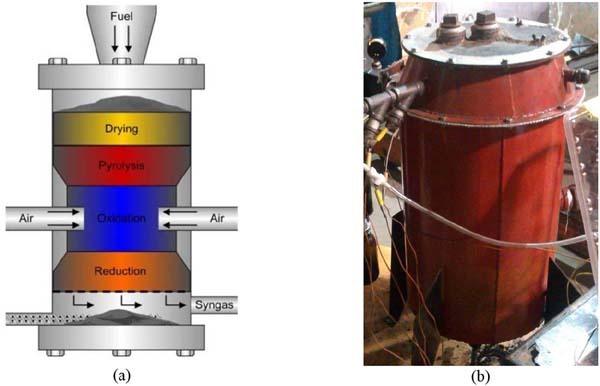 The process of gasification is investigated in Biomass Production Lab at McGill University, using a pilot-scale downdraft gasifier (GEK Level 4, Model V3.1.0) provided by All Power Labs Company (Berkley, California, USA). The nominal thermal input of the unit is 10 KW. The gasification unit is made up of three major parts: (1) Feeding; (2) Main reactor; and (3) Filtering. Feeding consists of a cylindrical stainless steel drum (feeding capacity of 141,342 cm3) followed by a drying bucket (volume of 39,100 cm3). It was initially assembled for batch but has been improved for continuous operation using a screw biomass conveyor connected to a motor. The feedstock in the drying bucket is dried using a cyclone column connected at the bottom of the bucket. The drum can hold enough feedstock to support many hours of continuous operation. The main reactor is a cylinder-shaped vessel (height of 39.4 cm and diameter of 35.5 cm) equipped with air nozzle supports to provide the reactant as well as gas lines to transport the produced gas into the filtering system. The bottom of the reactor is filled with wood charcoal up to about 4 inches below the Reactor Lid. The charcoal is required in order to provide fuel for the ignition of the system. The remainder of the vessel is filled with feedstock materials placing on the charcoal. There is a reticular grate at the bottom of the reactor to hold the feedstock and only allow the ash pass through. Furthermore, a monometer is connected to the reactor frame for measuring the pressure inside the reactor using testing. 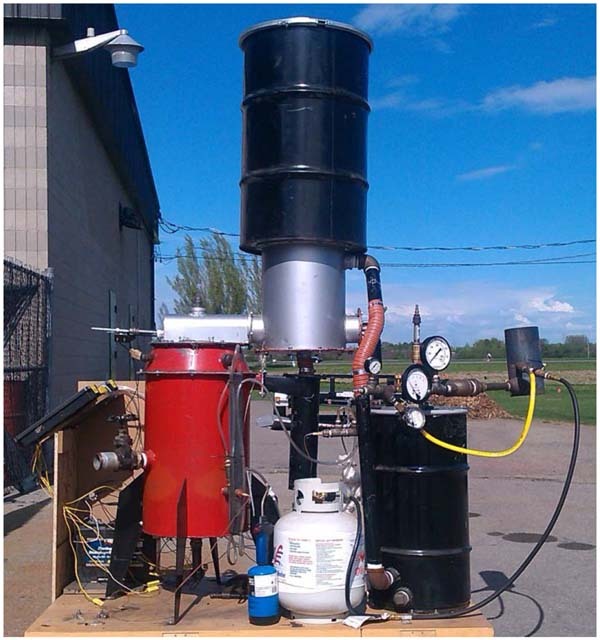 A charcoal filtering system removes any possible water, tar and particulates from the syngas. The system is a cylindrical drum filled with charcoal media. Based on GEK operation instruction, the first 5 cm (~2 in) of space is filled with 2.5 cm (~1 in) diameter charcoal and the remainder of the volume is filled with charcoal size of 1.2 cm to 0.15 cm (0.5 in to 0.06 in). A perforated disk is placed on the charcoal and two filter foams are placed on top of the disk. Figures 3 show an assembled GEK unit. A GEK gasifier control unit (GCU) is used to monitor and control temperature and pressure during the operation. For this purpose, 9 thermocouples and 3 pressure indicator have been installed within the unit. Before starting the system, cold tests are required to be performed in order to check for any possible air leaks in the gasification unit. The cold tests are performed by connecting the compressor to the unit and increasing the air pressure to 5 inches of H2O. Once the cold tests is over the unit starts by injecting liquid fuels into the ignition port and igniting the fluids using a propane torch. During the process, the syngas gas exits the reactor from the bottom and enters the cyclone and charcoal filtering chamber and is combusted in the flare burner. During the operation, biomass material is gasified and generates waste ash which passed through the grate. At the end of the cycle, the generated ash is collected from the bottom of the reactor using a rotary handgrip. Based on the proximate and ultimate analysis of the feedstock, each biomass material has different properties that can be used in the gasifier. Table 2 demonstrates the potential of biomass gasifier feedstocks. The coals have the highest amount of heating value at 24.6 and 27 MJ kg-1 for subbituminous and bituminous types, respectively. However, comparing the biomass feedstock, sawdust has the maximum potential of producing calorific value at 19.3 MJ kg-1. An interesting difference between coal and biomass lies in the composition of their organic matter: woody biomass contains typically around 50 % carbon and 45 % oxygen (by mass), whereas coal contains (depending on coal rank) 60–85 % carbon and 5–20 % oxygen. The high oxygen content of biomass is beneficial because less oxygen needs to be added for gasification; however biomass has a lower calorific value compared to coal and other fossil fuels (Milne et al.). The type of reactant used in the process can determine the heating value of the syngas, air-based gasifiers typically produce a syngas, containing a relatively high concentration of nitrogen, with a heating value between 4 and 6 MJ m-3. Oxygen and steam-based gasifiers produce a syngas containing a relatively high concentration of hydrogen and CO with a heating value between 10 and 20 MJ m-3 (Ciferno and Marano). When air (instead of oxygen) is used, the gaseous product is usually called producer gas while it is termed synthesis gas (syngas) when oxygen or steam is used. Under typical gasification conditions, oxygen levels (including oxygen in the feedstock) are restricted to less than 30% of that required for complete combustion to take place (Abdul Salam et al., Stultz and Kitto). The potential market for syngas is based on the assumption that syngas could replace fossil fuel in some regions where it is used. Approximately 30% of the world primary energy consumption is for the transportation fuels and chemical industry (IEA, Boerrigter and Rauch). 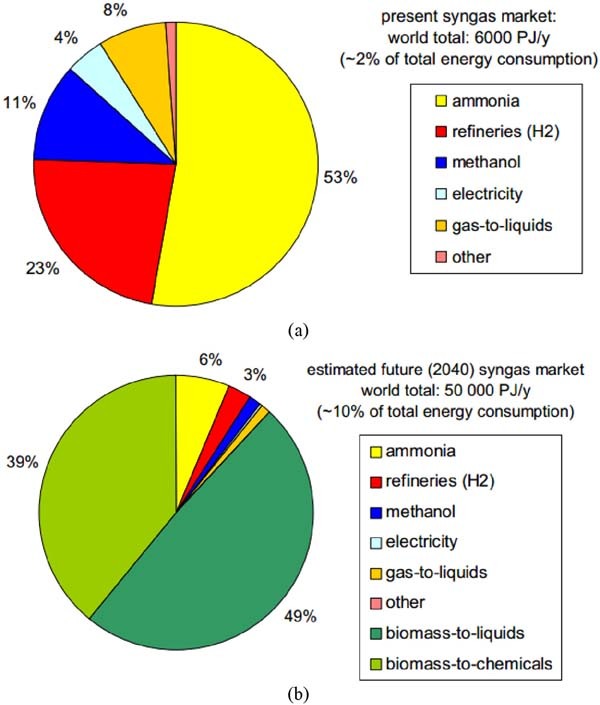 Figure 3 presents current and perspective of syngas market in 2040 around the world. Renewable energy from biomass using a gasification system is an environmentally friendly method and helps to reduce our dependence on fossil fuels. Biomass gasification offers advantages over the direct burning of biomass. Unlike, power generation with direct burning of biomass in a boiler, gasification can be used for very small scale decentralized power generation projects up to 20 kW. A gasifier system is a simple device consisting of a cylindrical container with space for fuel, air inlet, gas exit and grate. It can be made of fire bricks, steel or concrete and oil barrels. Since syngas is produced before final combustion, some of the problematic and poisonous chemical compounds can be cleaned and filtered before it is burned (USEPA). A complete gasification unit consists of pre and post treatment steps and gas conditioning components that can significantly decrease some of the harmful gases normally produced through other combustion systems. Compared to other options of renewable energies, biomass gasification is a promising alternative to produce high quality energy from different available feedstock. In parallel, gasification is showing a lot of promise both in research and commercial applications (Dion et al., Basu, Devi et al.). Abdul Salam P., Kumar, S., and Siriwardhana, M. (2010) The status of biomass gasification Thailand and Cambodia, Asian Institute of Technology. Agricultuare and Agri-Food Canada, Feedstock, Available at: http://www4.agr.gc.ca/AAFC-AAC/display-afficher.do?id=1326507543999&lang=eng. Brar J.S., Sinagh K., Wang J., Kumar S. (2012) Cogasification of Coal and Biomass: A Review, International Journal of Forestry Research, doi:10.1155/2012/363058. Basu, P. (2010) Biomass Gasification and Pyrolysis: Practical Design and Theory, Production of Synthetic Fuels and Chemicals from Biomass (Chapter 9), Elsevier Inc, DOI: 10.1016/B978-0-12-374988-8.00009-X. Basu P. Biomass gasification and pyrolysis: practical design and theory. Burlington, MA: Academic Press; 2010. Devi L, Ptasinski KJ, Janssen FJJG. (2003) A review of the primary measures for tar elimination in biomass gasification processes. Biomass Bioenerg 24:125, 2003. Bridgwater, A.V., Evans, G.D. (1993) An Assessment of Thermochemical Conversion Systems For Processing Biomass and Refuse, Energy Technology Support Unit (ETSU) on behalf of the Department of Trade, ETSU B/T1/00207/REP. Boerrigter H., Rauch R., Review of applications of gases from biomass gasification, Published as Chapter 10, titled: “Syngas production and utilisation” in the Handbook Biomass Gasification, edited by H.A.M. Knoef and published by the Biomass Technology Group (BTG), The Netherlands in 2005. Ciferno J. P., Marano J.J. (2002) Benchmarking Biomass Gasification Technologies for Fuels, Chemicals and Hydrogen Production, Prepared for U.S. Department of Energy National Energy Technology Laboratory. Chiang, K-Y., Chien, K-L., Lu, C-H. (2012) Characterization and comparison of biomass produced from various sources: Suggestions for selection of pretreatment technologies in biomass-to energy. Descriptions of the biomass fuel composition. Available at http://bisyplan.bioenarea.eu/fuel_appendix.html. Accessed April 2013. Dion L-M., Lefsrud M., Orsat V. (2011) Review of CO2 recovery methods from the exhaust gas of biomass heating systems for safe enrichment in greenhouses, bio mass and bio energy 35 2011 3422–3432. Elliot, M.A. and Linden, H.R. (1966) Gas manufacture. In: Kirk-Othmer: Encyclopaedia of Chemical Technology, 2nd Edition. Vol. 10, Ed. H.F. Mark, J.J. Mcketta Jr., & D.F. Othmer, John Wiley & Sons, N.Y. 353. Foley G. and Barnard G. (1985) Biomass Gasification in Developing Countries. Technology and Engineering, Earthscan, London, UK. International Energy Agency (IEA): World energy outlook, ISBN 92-64-17140-1 (1999) pp. 225. Irps. H. (2003) Energy sources: non-renewable and renewable, Agricultural mechanization and automation, Vol 1. Kumabe K., Hanaoka T., Fujimoto S., Minowa T., and Sakanishi, K. (2007) Cogasification of woody biomass and coal with air and steam, Fuel, 86(5–6), 684–689, 2007. Midilli A., Dincer I., & Rosen M.A., (2007) The role and future benefits of green energy. International Journal of Green Energy, 4: 65–87, 2007. Milne, T.A., Evans, R. J. & Abatzoglou, N., (1997) Biomass gasifier “tars” their nature, formation, destruction and tolerance limits in energy conversion devices. In: Making & Business from Biomass. Proc. 3rd Biomass Conference of the Americas. Ed. R.P. Overend & E. Chomet. Vol I: 729–738. Elsevier Science, Oxford. Mendua, V., Shearina, T., Campbell, J.E., Jozsef Storka, Jr.b., Jaec, J., Crockerd, M., Huberc, G. and DeBolta S. (2011) Global bioenergy potential from high-lignin agricultural residue. 109(10) 4014–4019, 2011. McKendry P. (2002) Energy production from biomass (part 3): gasification technologies,” Bioresource Technology, 83(1), 55–63. Nhuchhen, D.R., Abdul Salam, P. (2012). Estimation of higher heating value of biomass from proximate analysis: A new approach, Fuel, 99, 55–63, 2012. Pakdel H. and Roy C. (1991) Hydrocarbon content of liquid products and tar from pyrolysis and gasification of wood, Energy and Fuels, 5, 427–436. Paisley, M.A., Anson, D., Biomass Gasification for Gas Turbine Based Power Generation, Presented at the International Gas Turbine & Aeroengine Congress & Exhibition, 1997. Prins, M.J., Ptasinski, K.J., Frans J.J.G. Janssen, (2007) From coal to biomass gasification: Comparison of thermodynamic efficiency, Energy, 32(7), 1248–1259. Quaak P, Knoef H, Stassen HE. (1999) Energy frombiomass a review of combustion and gasification technologies. Washington, D.C.: World Bank; 1999. Rajvanshi A.K. (1986) Alternative Energy in Agriculture (Book), Chapter 4: Biomass Gasification, Vol. II, Ed. D. Yogi Goswami, CRC Press, 83–102. Stultz, S.C., Kitto, J.B., Steam–-it's generation and use, (1992) The Babcock & Wilcox Company, Barberton, Ohio USA. Sims L. (2003) Bioenergy Options for a Cleaner Environment: in Developed and Developing Countries, Liquid and Gaseous Biomass Fuels (Chapter 4), Elsevier Inc.
 Sjöström K., Chen G., Yu Q., Brage C., and Rosén, C. (1999) Promoted reactivity of char in cogasification of biomass and coal: synergies in the thermochemical process, Fuel, 78(10), 1189–1194, 2012. Total Midyear World Population 1950–2050. Available at http://www.npg.org/facts/world_pop_year.htm. Accessed April 2013. US Department of Energy. (2009) Thermochmical conversion platform review report: An Independent Evaluation of Platform Activities for FY 2008 and FY 2009. U.S. Environmental Protection Agency, Combined Heat and Power Partnership (CHP), 2008. Yin, C-Y. (2010). Prediction of higher heating values of biomass from proximate and ultimate analyses. Edris Madadian is a Ph.D. candidate in the field of Bioresource Engineering at McGill University. He is conducting the biofuel project which purpose is mainly focused on the proper handling of biomass feedstock for enhancing the gasification and combustion efficiencies for space heating and carbon dioxide enrichment in plant environments, especially on the engineering design of the process. Edris also received his BSc and MSc in the fields of Civil and Environmental Engineering. Dr. Mark Lefsrud, an Associate Professor at McGill University leads the Biomass Production Laboratory. His upbringing on a farm and work in the oil fields of Alberta, Canada combined with his B.Sc. and M.Sc. in Agricultural and Bioresource Engineering and a Ph.D. in Plant Physiology gives him a very strong background in the fields of agriculture, biology, and engineering. His research program deals with the development of bioprocesses and improvements in plant growth environmental energy usage. Camilo Perez Lee is a master student in the field of Bioresource Engineering at McGill University. He is conducting research on harvest & postharvest densification under the supervision of Dr. Mark Lefsrud. Camilo's research focused on the bioenergy supply chain planning and logistics from harvesting to biofuel. He also received his BSc in the field of Industrial Engineering. Yves Roy is a Master Student in Bioresource engineering on the Macdonald campus of McGill University. His research focused on the development of a system able to extract the CO2 form the flue gas of a wood pellet furnace for greenhouse CO2 enrichment. He is also working on the development of a gasification unit with continuous operation with different feedstocks that could be used to produce clean CO2 for greenhouse operations.